But her discovery of his journals nearly two years later reveals a far different man than she imagined-a gentleman scholar and antiquities collector who apparently loved his new wife deeply. Emily’s desire to learn more about her late husband leads her through the quiet corners of the British Museum and into a dangerous mystery involving rare stolen artifacts. To complicate matters, she’s juggling two very prominent and wealthy suitors, one of whose intentions may go beyond matrimony into darker realms. I really liked the premise and the beginning of this one – mainly because it wasn’t your ordinary romance. A young widow is falling in love with her late husband – but only when she has enough time to explore and appreciate all aspects of his character. After his death. Of course she knows it’s too late but still she cannot help herself. Her husband admired her looks. He ordered her portrait with Renoir in Paris. He called her ‘Kallista’ (‘the most beautiful’ in Greek) in private. What not to love? In the meantime Emily gets interested in the culture and art of Ancient Greeks and Romans, visiting regularly the British Museum, reading Homer, even learning koine Greek – I couldn’t approve more. She also starts to defy society’s conventions, to push the limits imposed by the ton. As a result she is becoming far more liberated than anyone, herself included, would ever dare imagine – a strange leap of faith but entertaining nevertheless. Staying with gentlemen instead of withdrawing to the drawing room with the ladies after a meal? Not a problem! Drinking port instead of sherry? Sure, why not? Going to Paris on a short notice with only a maid as a companion? Why not? She can afford it and who is to stop her? Certainly not her mother! Still… after some time (roughly one third of the book) the plot started to wear thin and Emily was turning into a Mary Sue. I was quickly bored by all the eligible bachelors sniffing after her and all her lady friends envying her good looks. Unfortunately, her fresh love for her late husband soon became a bit ridiculous as Emily suffered a few TSTL moments with regards to the merits of her two suitors. Her endeavors to unmask the villain were quite pathetic too. The fact that her husband SPOILER really stayed dead was another disappointment – overall I hoped for more twists and surprises. Finally, this novel is just historically-flavoured, not historical. Alexander falls into the standard trap of authors who think that writing historical fiction is easy. If you think you can write historical fiction by plopping your characters who think and feel exactly like 21st century people into the nineteenth century with a few descriptions of clothes, a maid and a butler, you are just deceiving yourself. There was nothing Emily did or said that sounded remotely like she was raised in the 1880s and, after some time, it started to grate. The Lady Emily series is 11 novels long. I gather it must have been successful. Unfortunately it is not for me. Meh. 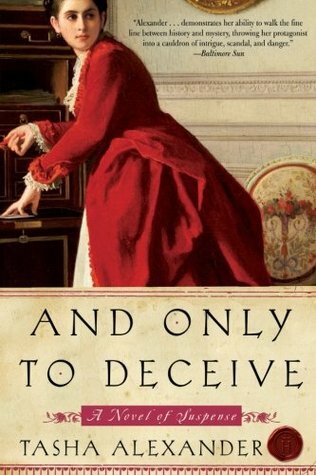 This entry was posted in book review, chicklit, cozy mystery, crime, historically-flavoured, suspence and tagged disappointment, meh, only to deceive, series alert, tasha alexander. Bookmark the permalink. I have to agree. I finished it but only just, and never picked up volume 2. My feelings exactly. I was really surprised when I found out that series was so long. You know me well :).